After making its debut during Comic-Con in San Diego last week, The Hunger Games: Mockingjay Part 1 trailer has finally arrived online! 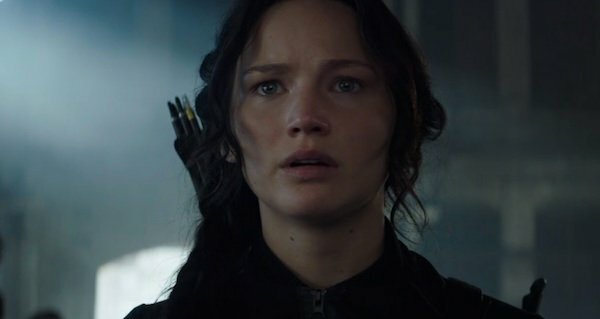 As you can see in the video, it looks like Katniss has been called to fight again. Will she be able to rise up once again as the Mockingjay? She says she will, but her tone has us wondering if Katniss Everdeen has much fight left in her. The trailer has Plutarch Heavensbee (Philip Seymour Hoffman) talking to President Coin (Julianne Moore) about enlisting Katniss to lead the rebellion. Knowing she would inspire the rebels to fight against the Capitol, Plutarch is determined to get Katniss back in action, though Coin seems to realize that the Games have done some serious damage to her. And it's true. Even before we see Katniss's face, it's evident by the way she's walking that she may not be at her absolute best. She looks exhausted, but there does seem to be a note of determination in her voice as she says, "I am, I will." The video also shows off some of the action, along with President Snow (Donald Sutherland) saying that any association with the Mockingjay symbol is forbidden. The teaser trailer made its debut at Comic-Con, and was available exclusively at Best Buy and select Samsung Galaxy devices throughout the weekend. Fortunately, fans didn't have to wait long for the video to go live, which it did courtesy of the Hunger Games office Facebook page. Directed by Francis Lawrence, The Hunger Games: Mockingjay Part 1 arrives in theaters November 21. The cast includes Jennifer Lawrence, Josh Hutcherson, Liam Hemsworth, Woody Harrelson, Elizabeth Banks and Philip Seymour Hoffman.